I've been quite intrigued with Dan Meyer's Any Qs on Twitter and his Three Acts method of teaching math as described on his blog. This year, we've been showing his Any Qs videos as part of our math morning meeting. 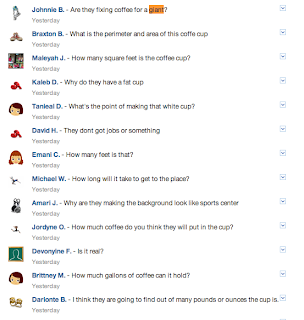 The students use an Edmodo discussion stream "back channel" to send in questions the video makes them wonder. Then we discuss and consider ways we'd move into an "Act 2" to solve the problem. As we're still developing our problem solving skills, we had yet to actually pick a question and solve it. Thus far it has been an exercise in curiosity, and developing a real thirst for mathematics. Yesterday we took the big step into Act Two. 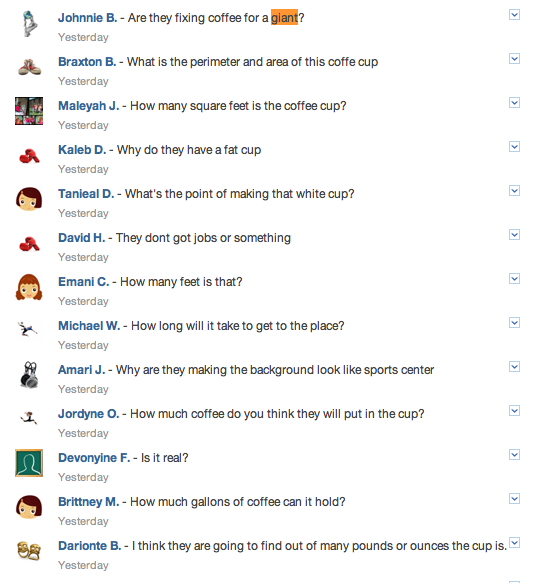 We did the same as usual, showing a video and asking questions through our Edmodo discussion screen. We watched the first act of Dan's 3 Acts lesson, "Hot Coffee". After the students watched this giant coffee cup began to fill, inevitably many began to wonder, "How much Coffee can fit inside of it?" (among many other great and hilarious questions, as you see here). The students wondered aloud for awhile, a few shouting out guesses and telling their neighbors wild estimates. 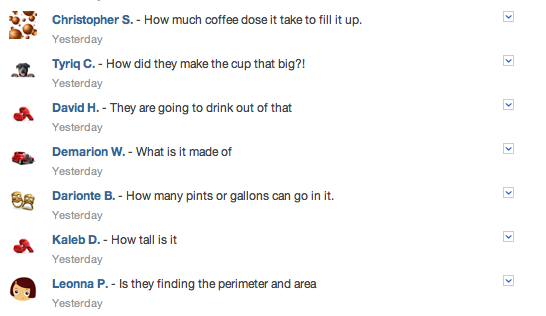 Then I showed them the general dimensions of the cup. Dan's site lists 7 ft x 7 ft, but I changed it to 8 ft x 8 ft since it gives a more manageable answer (his original lesson includes standards for 6-12 students so while I knew that my 4th/5th kids could definitely rise to the occasion, I also wanted to scaffold it slightly). They began to grapple with the concept and discuss what information they needed, what information they did not need and what they had to do to solve the problem. Since the question they asked didn't involve the word "Volume" it was interesting to see that many students didn't immediately go there. 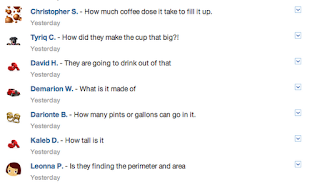 They wondered first about surface area, circumference and the diameter. After/towards the end of the second act, I also gave them the conversion rate and rounded it to 1 cubic foot = 7.5 US customary gallons. They had been learning about conversions and so were happy to take this new piece of information. However, some quickly forgot about it in their problem solving journey, leaving the answer in cubic feet, while others ran with it. As students caught on, the path to solution began to catch like wild fire. They were excited to share their strategies and even more excited when their strategies yielded results. 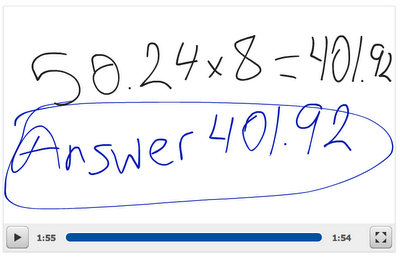 In the third act, as they problem solved, I had them use the app Educreations to capture their thinking. 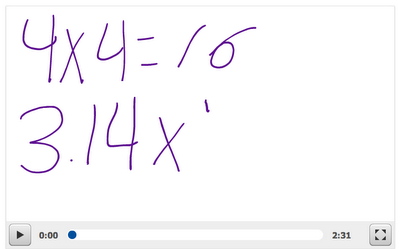 They created short screencasts to show their math metacognition and help them keep track of the process. Here are a few. Note that they did not use microphones nor did they have a stylus. My students and I really enjoyed this way of presenting problem solving; we are going to apply it to more and more of our curriculum. I thank Dan Meyer for being so open to sharing his work with the world! I recently wrote a piece for Education Week: Teacher. It is basically a synthesis of my most popular blog posts from this site, but may be a helpful overview of Technology Redefinition for those who are interested. 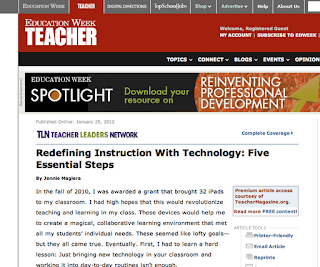 The title is "Redefining Instruction with Technology: Five Essential Steps". Thank you everyone for reading and retweeting! I welcome any and all comments! 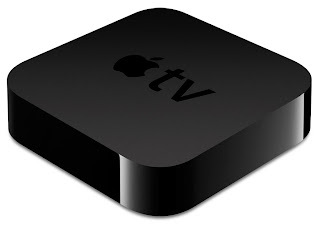 Over the holidays I asked Santa for an AppleTV and boy did that jolly old elf deliver. I had some networking issues to work out (see the end of this post for the issues and solution), but once that was taken care of, the magic began. This $99 device has become the all-in-one accessory for my iPad classroom. It has replaced my TV, my doc cam, and even my interactive whiteboard! How, you ask? Read on, friend. AppleTV starring as... a TV! 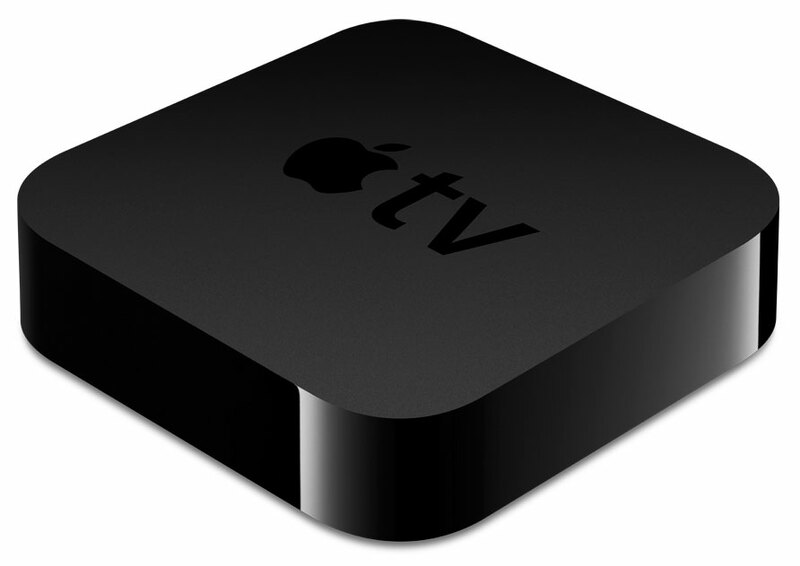 On the simplest level, the AppleTV can stream media. So if I want to show a quick YouTube clip about the polar ice caps or that 2 jugs of water puzzle scene from Die Hard with a Vengeance, a NetFlix movie about Running the Sahara or a Vimeo clip I've produced, I simply stream it from this tiny box. No more rewinding old VHS tapes with dated music and conveniently multi-cultural kids grinning madly into the camera. Instead, I can show authentic media to support and enrich my curriculum at a push of a button. AppleTV starring as... a Doc Cam! Using the AppleTV's AirPlay Mirroring function, I can have any iPad in my classroom instantaneously mirrored - sound and all - to the screen. Wow! Since I'm having students complete their work digitally using the app PaperPortNotes as seen in the clip to the right, it is a simple next step to have them display their work and thinking on the projector. The best part? No wires! No wait time! More time to learn! AppleTV starring as... an Interactive Whiteboard! When I first got my Promethean board, I was quite concerned about being anchored to it constantly. I like to roam the room while teaching; I like to be able to engage the kids through proximity and movement. I first started using the SplashTop app to remotely control my computer through my iPad. It worked quite well as you can see in this clip. When I added the AppleTV to the mix, I realized that I no longer even needed the Promethean Board. I could simple create presentations directly on an iPad and stream them to a projector or TV as I had done through AirPlay. Using an App like Educreations, I could turn any wall into an interactive whiteboard using a projector and my AppleTV. Now, that's super. In our district, many schools have two wireless systems: an enterprise system and a secondary system. Unfortunately neither will run the AppleTV. ATVs aren't compatible with enterprise networks and the second system only will run the ATV sporadically due to a "rogue broadcast signal" issue that's beyond my tech understanding. What I do understand, however is the workaround. I bought a $179 AirPort Extreme wireless base station and plugged it into the ethernet in my wall. I then got a second ethernet cable and plugged it into my AppleTV. I followed the step-by-step directions in the AirPort Extreme manual to set up my own Wireless Network. Next, I had all of my kids hop onto the new wireless signal and voila! My ATV is on all the time now, no more wireless signal drop for my kids on their iPads and my entire system is more stable! For under $300 I have a system that is faster, more efficient, and wireless! We have 5 students at each table and have assigned each seat a color. Each table has five differently colored iPads, and so when a student in seat "red" reaches for an iPad he or she doesn't need to rummage through the bin; they can easily see the red case and get "their" device. This helps for apps that save data on the iPad (Pages, Keynote, etc. 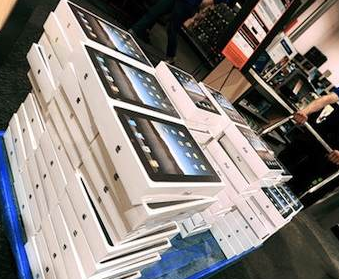 ), ensuring that the student gets the same iPad each time. Additionally, it helps with accountability as the students know that they are responsible for all activity on "their" iPad throughout the period. The cases cover the backs - where we originally had numerated stickers showing which iPad was which. Now we have gone with an idea originated by iPad colleague Carolyn Skibba at Burley Elementary - change the backgrounds and lock screens of each iPad to its number. In cases where the iPads are truly 1:1 - that is a single student is using a single iPad all day, every day - many teachers choose to take a picture of the student holding a number and use it as the background. However, I teach a differentiated classroom so although during each period there is a 1:1 student to iPad ratio, three sets of students cycle through the devices each day. Therefore, I used generic numbers as the wallpaper. 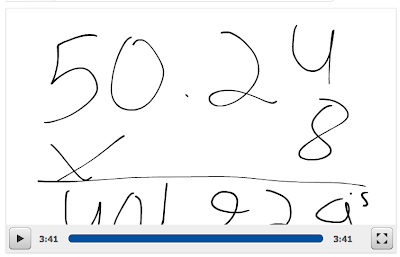 To do this, I typed the numbers in a Pages document on my MacBook and took a screenshot of the number. I then uploaded all of the numbers to my Google Site and was then easily able to download the picture and set it as the wallpaper/lockscreen from each iPad. I did it this way - rather than creating the image on the iPad - for two reasons. One, if I did it on the iPad, the image would show other things - the date/time I am taking the picture, the cursor, the editing bar of Pages - and this may be a distracting backdrop for my students. Second, if I created these images on the iPad, it would take longer: I'd have to open Pages, set the font, the size, etc 32 individual times. Whereas on my Mac I was able to set it once and screenshot away. It was as simple as typing each number and took under 2 minutes total. However, not to worry - you don't have to do either! You can visit my webpage and download the number images to your iPads right now :)! Open your iPad's Safari app and type in the URL of the site that you'd like to visit. 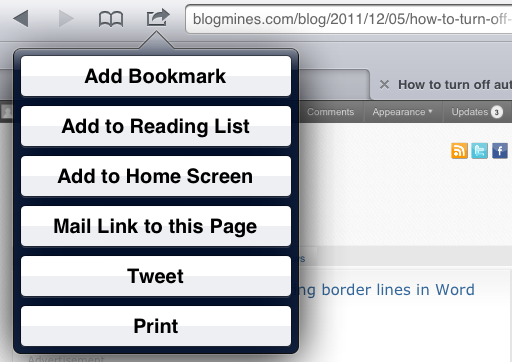 Tap the bookmarking icon in the browser (the arrow coming out of a rectangle), to "add to home screen". This will create an app icon on your homescreen and allow your students to visit the page with only a finger tap! Group your apps into folders based on level. You could create three facts practice folders called "Facts 1", "Facts 2", and "Facts 3". In the first folder you could place fact fluency apps that enhance basic addition/subtraction skills, the second folder could house apps that review multiplication/division facts and the third folder may have apps that introduce algebra. This way you could direct students to the correct folder and give them some choice in which app to use - rather than having students search for a "just right app" or spend time on an app that is too difficult or too easy for them. 5 - Try "Send to Dropbox"
Instead of flooding your inbox with student work emails every day, try Send to Dropbox, a site that allows your students to send to a generated address which dumps files into your dropbox folder. This will allow your more organization and even better - free up that inbox! For additional tips, check out this post from September 2011. Friend and technology consultant, Lucy Gray, recently shared this New York Times article. As she points out, it seems fairly one-sided and only outlines pieces of Idaho's technology plans; and this is one of a growing number of anti-education technology news articles appearing of late. I agree that there are a lot of negative, one-sided stories regarding technology in schools, but also think that there was one good point in this article (though made passively and should have been in higher emphasis). As you may have seen, many teachers are scared of technology because they don't know what it could do, have seen poor (or no) modeling, or don't know how to do what they have seen. An EdTech rollout, no matter how powerful the devices and programs, will only be as effective as each individual teachers' implementation. Simply throwing devices into a classroom and putting "technology integration" as a checkbox on evaluation forms will result in - at best - mixed results. Teachers need support that speaks to their different levels of technology expertise. PD needs to reflect best practices we use for our own students - it must be differentiated, time-efficient and hands-on. Furthermore, it shouldn't cease after an initial "here's what's in the box and here's how you can use it" session. It should continue and evolve as teacher needs change, familiarity increases and confidence waxes and wanes. I believe that much of the success seen in Chicago's iPad program is due to the supportive and responsive nature of the monthly PD embedded in its pilot - before and during the integration of these devices. Perhaps teachers like Ms. Rosenbaum (cited in the article) would start spending their evenings creating ePubs instead of writing protest letters if they had better modeling, training and access to quality digital content. Additionally - and I don't know for sure if this is the case in Idaho - I have seen schools that try and integrate technology for technology's sake. This is what gives EdTech a bad rap. It isn't enough to have devices in the classroom; teaching and learning should be redefined with the power of the devices in mind. I hope educators who are transforming education with technology can continue to promote and publicize these best practices to show what a teched-out classroom can really do.